Picking a fight with Trump, Richard Cordray and the Consumer Financial Protection Bureau are making it easier to sue banks. In the Trump administration, the Consumer Financial Protection Bureau is the equivalent of a fort abandoned behind enemy lines. Many Republicans are attempting to blow the agency to smithereens, while the Obama administration that defended it is no more. Yet even as Obama appointees resign (I’m looking at you, Walter Shaub!) or are fired (Hi, Preet Bharara! 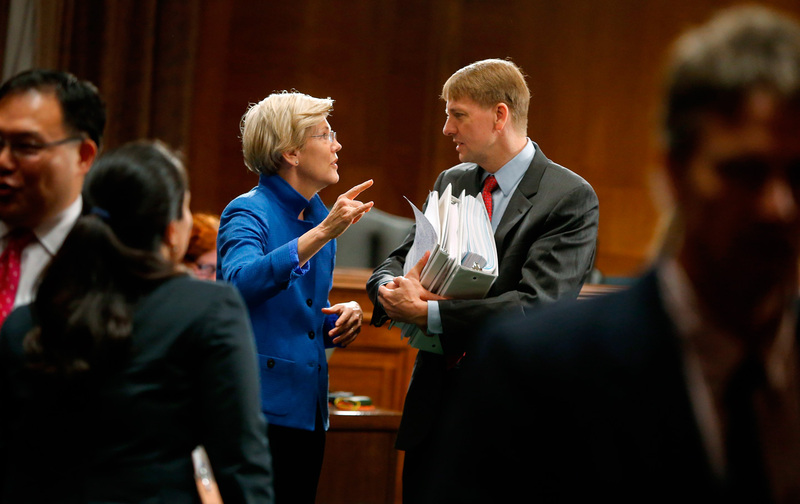 ), CFPB head Richard Cordray continues to fight on at his post. The latest skirmish: On Monday, the CFPB announced final regulations that will, beginning early next year, significantly change how banks, credit-card companies, prepaid-card issuers, and other financial-services companies handle disputes with their customers. The new regulations ban contracts that force consumers into mandatory arbitration, allowing them instead to join class-action lawsuits against these firms. Cordray’s action is a terrific strategic move, likely pushing Republicans to repeal enormously popular regulation, or step aside and allow it to stand. In 2016, the CFPB sought public comment on a proposed rule that would limit the use of mandatory arbitration in financial contracts. The initiative was an attempt to get a handle on a growing threat to consumer rights. Over the previous decade, increasing numbers of companies, ranging from employers to credit-card issuers, inserted language into their contracts that railroaded customers into private arbitration to settle disputes. These are frequently take-it-or-leave-it clauses, and they effectively strip consumers of the ability to turn to a judge and jury for redress if a problem arises. No surprise, banning mandatory arbitration is rather popular among consumers. According to polling conducted by the Pew Charitable Trusts, just under 90 percent of those they surveyed wanted the right to join a class-action lawsuit against a bank, and support for the position barely varies by party. Democrats and Republicans alike want the right to enjoy their day in court. “It will be all hands on deck,” Richard Hunt, the president and chief executive officer of the Consumer Bankers Association, an industry trade group, told American Banker. The threat to the arbitration rule is significant. More than a dozen Obama-era regulatory initiatives have been overturned courtesy of the Congressional Review Act, which not only offers up a short-term window for Congress and the new administration to overturn rules put in place by the previous administration with a mere majority vote, but also forbids the issuing department from putting forth a substantially similar regulation in the future. Until recently, many observers had suspected that Cordray would not go ahead and issue the final version of the arbitration rule. Why take the chance? The CFPB is, after all, at serious risk itself of sudden death or incapacitation. The Republicans, who have been gunning for the agency since the day it opened its doors, now control the presidency and both houses of Congress. In June, the House passed the Financial Choice Act, which would leave the CFPB a shell of what it is now, taking away much of its regulatory power. Last week, Hensarling threatened CFPB Director Richard Cordray with “contempt proceedings” if he released a final version of the arbitration rule. His office did not respond to an e-mail from The Nation asking if that threat still stands. Then there are the courts. Last fall, a federal circuit court ruled that the president could remove the head of the CFPB for any reason whatsoever, instead of for cause, as the legislation establishing the agency established. That case is currently under appeal. Moreover, Obama-era arbitration rules in other areas are falling by the wayside. Last year, the Centers for Medicare and Medicaid Services published regulations banning nursing homes that took money from the two programs from inserting mandatory-arbitration clauses in contracts with patients. The Trump administration is now rolling those back. At the Department of Education, another proposed ban on mandatory arbitration, this one involving colleges and students, was put on hold last month by Education Secretary Betsy DeVos. So what could be motivating Cordray to take the risk? While almost no one doubts a repeal of the arbitration legislation will pass the House, the Senate is another matter. The ongoing attempts by Republicans and the Trump administration to repeal the Affordable Care Act, which would result in depriving more than 20 million people of health insurance over the next decade, is opening fault lines among the GOP. It’s also taking up a substantial amount of time—perhaps so much that few will want to make room on the legislative schedule to attempt to overturn yet another popular government initiative. It’s important to note that the CFPB doesn’t ban all use of mandatory arbitration in financial-services contracts: It still permits the practice when it comes to individual disputes. But even here, the CFPB scored one for the team; the regulation requires impacted companies to submit data about the arbitrations to the regulatory authority, which plans to publish the findings, something that will likely shed light on the frequently secretive process. While the ultimate victor is far from certain, Cordray most certainly won this round. In the process, he offered Democrats a lesson about the importance of standing up for what they believe in. Helaine OlenTwitterHelaine Olen is the author of Pound Foolish: Exposing the Dark Side of the Personal Finance Industry and co-author of The Index Card: Why Personal Finance Doesn't Have to be Complicated.